John Edwards, An American Tragedy : It's All Politics Certain words and people seem made for each other. For John Edwards, the word must surely be tragedy. Now, there are more questions than answers. Who is the real John Edwards? Was the man who had the extramarital affair and child with Rielle Hunter the same one who emerged on the national political scene in 1998? Or did something change him? 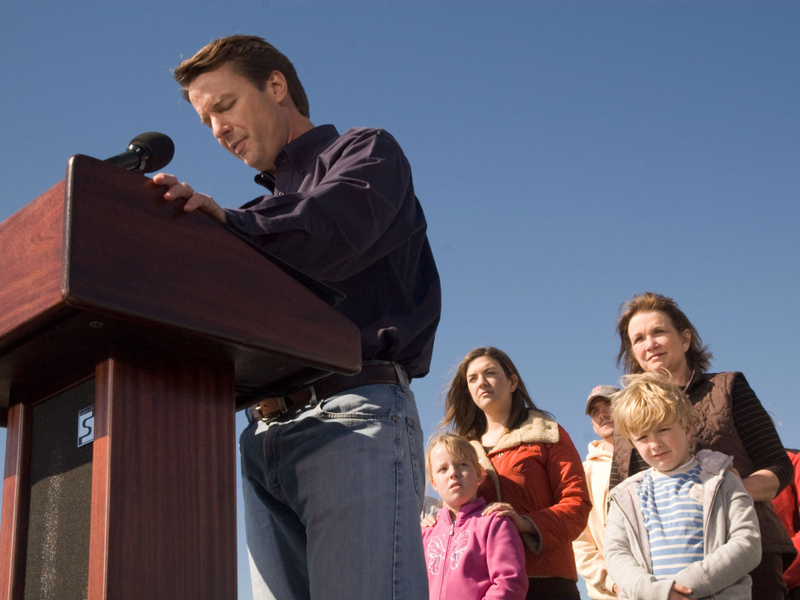 John Edwards exits the 2008 presidential race as his family watches, Jan. 30, 2008. Certain words and people seem made for each other. For John Edwards, the word must surely be tragedy, in all its dimensions. When he first came on the national radar in the 1990s, it was for his success as a personal-injury lawyer who was able to win large judgments for his clients, the families of those injured or killed in medical or other accidents, the daily tragedies caused by negligence. Then, when he ran for the U.S. Senate, most of us learned about the loss of his teenaged son Wade in a car accident. Incomprehensible tragedy. Later came word of the breast cancer battle being fought by his wife Elizabeth, the mother of their three surviving children, a disease that would eventually take her life. Unspeakable tragedy. But her death wouldn't happen before revelations about her husband's affair that produced a child and the end of the Edwards' marriage. Self-inflicted tragedy. On Friday came news that Edwards was indicted by a federal grand jury on charges related to his alleged effort to cover up the affair and child by using campaign donations, according to federal prosecutors. All of this flows into the larger tragedy, one of Shakespearean sweep, that is the sad story of Johnny Reid "John" Edwards. That this smooth-talking, preternaturally handsome son of a mill worker, this man who became a wealthy trial lawyer, U.S. senator, 2004 Democratic vice presidential nominee, and two-time presidential candidate now faces the potential of prison time is nothing short of stunning. Even though Edwards could strike a listener, back in his senator and presidential campaign days, as a little too perfect and smarmy, you discounted it because he was a politician, after all. Smarminess goes with the territory. He would talk about an effort to end poverty being "the cause of his life," at a time when few national politicians talked that way. That probably made many people pay attention to him who might not have otherwise. His wife Elizabeth, too, caused people to take notice of him. She had been an accomplished lawyer in her own right, was outspoken and had a great sense of humor. She was about as far from the political-wife-as-stage-prop as a political wife could be. That a woman like her could be wife to a man like him, or at least the man we thought he was back then, seemed a profoundly positive statement about him. Maybe he was deeper than his pretty boy looks suggested. Maybe he could be trusted. Now, there are more questions than answers. Who is the real John Edwards? Was the man who had the extramarital affair and child with Rielle Hunter the same one who emerged on the national political scene in 1998 or did something change him? Was it his son's death in 1996 that changed him in ways that even he didn't comprehend? Did he really think he would keep the affair secret? What if he had become vice president in 2004? In the end, his story has gone from too good to be true to even worse than we dared imagine. It is the stuff of fiction. It is the stuff of Shakespeare.